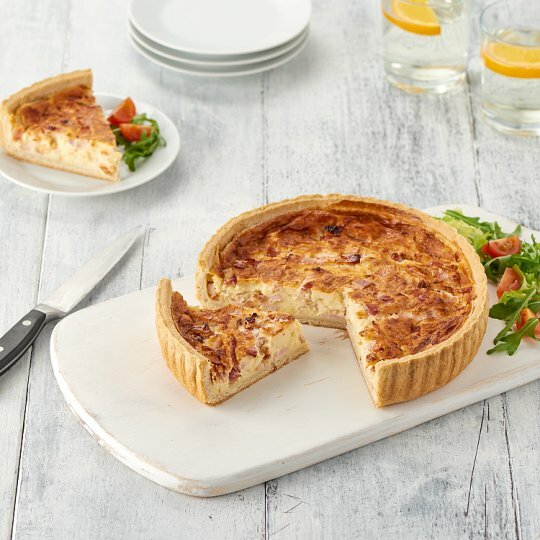 Smoked reformed bacon with added water, farmhouse Cheddar and extra mature Cheddar cheeses baked with free range eggs and cream in a shortcrust pastry, topped with maple cured streaky bacon lardons. Deliciously crumbly shortcrust pastry encasing an indulgent extra mature & farmhouse Cheddar and British smoked bacon filling enriched with cream and topped with maple cured streaky bacon. Perfect for buffets and summer picnics. Serves 8. 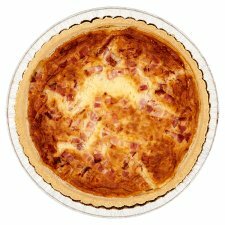 Shortcrust Pastry, Pasteurised Free Range Egg, Skimmed Milk, Smoked Reformed Bacon With Added Water (11%), Farmhouse Cheddar Cheese (Milk) (9%), Onion, Maple Cured Streaky Bacon Lardons (4%), Single Cream (Milk), Extra Mature Cheddar Cheese (Milk) (2%), Cornflour, Butter (Milk), White Pepper, Nutmeg. Shortcrust Pastry contains: Wheat Flour (Wheat Flour, Calcium Carbonate, Iron, Niacin, Thiamin), Palm Oil, Water, Rapeseed Oil, Dextrose, Salt. Smoked Reformed Bacon With Added Water contains: Pork, Water, Salt, Dextrose, Stabilisers (Sodium Triphosphate, Sodium Polyphosphate), Antioxidant (Sodium Ascorbate), Curing Salt (Sodium Nitrite). Maple Cured Streaky Bacon Lardons contain: Pork Belly, Salt, Brown Sugar, Maple Syrup, Curing Salt (Sodium Nitrite).